This is a nice late Elizabethan - Jacobean gold finger ring, dating to the late 16th - early 17th century. The ring is set with a magical coral gem, likely a replacement for a table cut diamond. The body of the ring is decorated and set with black enamel, traces which remain. This ring was a metal detector find from Aston in Oxfordshire, it was reported and processed through the Treasure Act and PAS. I have all the paperwork from the original finder (whom I purchased this ring). The paperwork describes this ring as being medieval and dating to the 13th century. Clearly wrong in my opinion, this ring is much later and of Elizabethan, not a medieval date. The original number for this find is BERK-2AC00C. 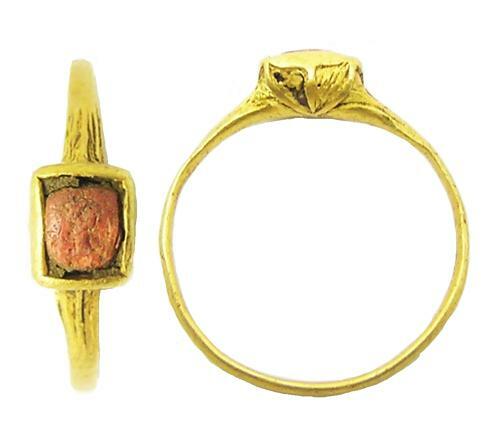 A nice and original Elizabethan period gold finger ring, in excavated but wearable condition!